As someone only just playing around with digital photography, I picked up this book as a complement to Bryan Peterson’s Understanding Exposure to get me started and provide some inspiration. Neither book disappointed. Where Peterson’s book is an excellent starting manual for people new to the world of photography, Freeman’s goes into much greater depth about composition techniques. The book is divided into 6 chapters, with each chapter further divided into sections dealing with a certain aspect of photographic design. Whilst some sections make reference to others, and in particular to photographs on other pages, in general it is possible to read this book piecemeal, skipping over bits that are of no interest, or returning and dipping into others. Each section abounds with example photographs, many also exploiting instances of photographs that didn’t quite work to further highlight a point. As many have already said, the writing is at times a little academic, and has the feel of being written with a photography or similar course in mind, but there is little that should prevent the average reader from understanding everything covered here. Freeman quotes a number of other photographers to illustrate his points, as well as dipping into other artistic fields to contrast the particular challenges of photography. 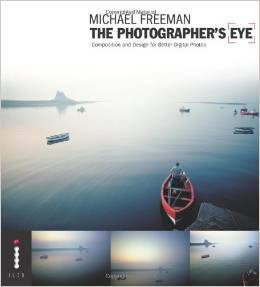 One genuine criticism I have of the book is that Freeman sometimes describes certain features of (albeit famous) photographs that, perhaps for economic or legal reasons, do not appear in the book. Whilst said images can easily be found with a quick search on the Internet, it nevertheless detracts from the book’s readability, particular for the novice this book is clearly aimed at. the photographs are rubbish – whilst I personally find this to be pretty harsh criticism, the fact that not every image is a spectacular masterstroke is in my opinion one of the book’s greatest strengths. These may only be ‘ordinary’ photographs, but by illustrating what makes them work it is easy to understand the principles being explored, whether focusing on the basic elements, perspective, timing, exposure etc. For instance, there is a photograph in one section of a house and a tree–an entirely throwaway image, one that you wouldn’t normally linger to look at for more than a split-second–but its inclusion is used as an illustration of using natural elements of the subject as a frame within the picture. the book has no lessons, it simply describes why some photographs work – this is more valid criticism, and I think down to personal taste. I found the book’s structure to be almost perfect – each section explored one particular concept, with a number of real-world examples used to highlight how this idea can be employed, and why this makes the photograph ‘work’ where a different angle, a different exposure, a different composition etc. failed. Ultimately, with a value price tag, and Amazon’s “Look Inside” feature, the buyer can’t go wrong with this one. If you agree with other comments that the photographs should be nothing short of spellbinding in order to be able to learn from them, by all means look elsewhere. Nevertheless, this book’s structure and the authorship, combined with ample photographic examples, make for an excellent beginner’s guide for improving composition, and being aware of what is possible behind the lens.